- Directed by Christopher Bell. This insightful documentary tackles the use of steroids in America. Professional body-builders are not the only people who have used them, and still do, to build up muscles—athletes, teachers, students, the director’s two brothers, and even women use steroids. Why? Because they idolize all the hulks in our society, namely Arnold Schwarzenegger. Director Christopher Bell wisely examines both sides of the steroid issue, showing its potential dangers, some of which have led to cancer and even death, but also showing that it’s not any more harmful than other drugs out there. A doctor admits that all drugs come with possible side effects. It would have been interesting had Christopher Bell spent an equal amount of time focusing on the negative side of steroids and delved into the scientific research rather than skimming over it, though. It’s worth mentioning that he includes an interview with a congressman to hear his perspective, but what about the FDA’s perspective? They are the ones that oversea the safety of steroids, so they would have added some more insight, perhaps. As an important anecdote for all you intelligent readers out there, the FDA can’t be trusted when it comes to regulating the use a different substance: MSG (Monosodium Glutamate). Did you know that MSG has derivatives (i.e. gelatin, spices, citric acid, natural flavor, and more) that the FDA approves of to protect businesses? Of course, McDonald’s food has some MSG as does Coke and Pepsi, but did you know that you can even find derivatives of MSG in organic foods? Companies add these ingredients as flavor enhancers so that you enjoy their product more and consume more of it, increasing their profits, while damaging and/or kills your neurons. In the long run, it also leads to a wide range of ailments in various degrees such as obesity, depression, migraines and even Alzheimer’s disease. Why doesn’t the FDA inform the average consumer about all this? It’s probably because if consumers were properly informed through honest labeling, a lot of “reliable” businesses would lose a lot of money when you'd stop buying/consuming their products. Knowing this, would you continue to pay these bullies who happen to be cheaters/deceivers as well? For those of you who truly care about health and evolution, something has to be done to stop the FDA and businesses from flushing the human race down the toilet. Click here for more important information about derivatives of MSG and here to learn about what specific foods to avoid that contain it. Anyway, back to this documentary, at least director Christopher Bell seems much more analytical and fair than the arrogant Michael Moore who loves jumping to conclusions. Bigger, Stronger, Faster* looks very well-edited and full of fascinating interviews that will enlighten you about the use of steroids no matter what side of the issue you’re on. Number of times I checked my watch: 1. Released by Magnolia Pictures. Opens at the AMC Empire 25 and Landmark Sunshine Cinema. - Directed by Jody Hill. Fred Simmons (Danny McBride), a Tae Kwon Do instructor who lacks the required physical strength of the field, struggles to muster all his strength to prove to his cheating wife (Mary Jane Bostic) that he’s the strongest one of all. Danny McBridge gives a very energetic performance à la Jack Black in Nacho Libre. Some moments have the quirkiness found in Napoleon Dynamite. Director/co-writer Jody Hill accentuates lots of awkward moments, some of which generate gut-busting laughs, although it’s usually in the expense of some one onscreen. He also tries to balance the comedy with drama with mixed results. 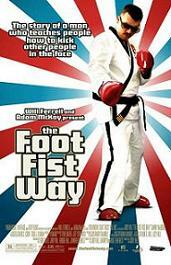 Esssentially, The Foot Fist Way is in the vein of Judd Appatow's mean-spirited comedies and has a split personality disorder: there’s initially witty and biting humor in the first half and then increasingly juvenile and repetitive humor as it the ludicrous, outrageous plot progresses into tedium. Not surprisingly, the film has been sitting around in limbo since debuting at the Los Angeles Film Festival in June of 2006 and, since then, Judd Appatow has raved about the film and became friends with Jody Hill. Number of times I checked my watch: 5. Released by Paramount Vantage. Opens at the AMC Empire 25 and Village East Cinemas. - Directed by C. Jay Cox. Matt travels back to his hometown in Arizona to attend the wedding of Ryan (James O'Shea), his friend from high school who he’s still in love with. Soon enough, he befriends Ryan’s fiancé, Alex (Tori Spelling) while trying to rekindle his love of Ryan and to stop their wedding. Despite following most of the clichés of the romantic comedy genre, plot is low on comedy and very low on romance. Matt has virtually no chemistry with Ryan and, moreover, it’s hard to see what brought Ryan and Alex together in the first place. Although it’s nice to see Tori Spelling acting once again, none of the performances, including hers, enliven the bland, awkward and silly plot. The screenplay by Ty Lieberman has too much stilted dialogue and contrived moments that fall flat. If only director C. Jay Cox would have added some more campiness/outrageousness or heightened the realism to add some believable drama, Kiss the Bride would have been at least entertaining, light and breezy. On a positive note, at least C. Jay Cox didn’t cast Paris Hilton in it which would have made it much more uncomfortable to watch. Number of times I checked my watch: 12. Released by Regent Releasing. Opens at the Quad Cinema. - Directed by Guillaume Martinez, Felipe Canales, Jeanne Paturle, Cécile Rousset, Alice Winocour, Alain-Paul Mallard and Olivier Bourbeillon. In French with subtitles. This diverse compilation of short films of various lengths has three bland films and three compelling ones. Among the bland films, there’s My Mother, Story of an Immigration, directed by Felipe Canales, a documentary about how the director’s mother reunited with her husband in Paris back in 1956. With a mixture of photographs and narration, it all seems rather straight-forward and fails to be intriguing enough—although it’s very well-edited. The animated short film One Voice, One Vote, directed by Jeanne Paturle and Cécile Rousset, tackles the issue of democratic voting during the 2007 elections, but lacks any bite or much-needed wit. At least the animation looks quite lively, although that’s not enough to keep you truly engaged. Next, there’s L'Origine de la Tendresse (The Origin of Tenderness), the longest of the short films at a running time of 32 minutes, about Elise (Isabelle Nanty), a museum attendant who struggles to find some meaningful substance to her mundane life. Exquisite cinematography and a few poetic, tender moments don’t compensate for the tedious plot that ultimately leaves you feeling cold and mostly bored. Among the compelling films, there’s Pen-Pusher, directed by Guillaume Martinez, a young man and woman aboard subway train communicate with one another without talking. Instead, they underline words in a text. Their chemistry flows naturally with plenty of wittiness and sweet moments, much like in the last year’s charming romantic drama, Once. Next, there’s The Last Day, directed by Olivier Bourbeillon, an initially simple, yet powerful documentary showing men at work at a military factory on the last day on the job. Even without narration or dialogue, the images speak and sounds speak for themselves and enrich the film to make it quite fascinating and ultimately more complex than meets the eye. Finally,Kitchen, directed by Alice Winocour, features a woman who struggles to kill two lobsters she bought for dinner. What ensues is darkly comedic, offbeat and somewhat surprising. Anyone sensitive to watching crustaceans getting harmed will find a few moments uncomfortable to watch, though. Number of times I checked my watch: 4. 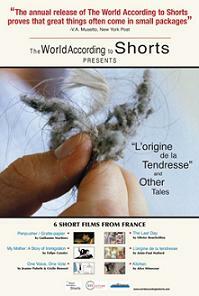 Released by The World According to Shorts. Opens at the Cinema Village. - Directed by Tom Kalin. Based on the novel by Natalie Robins and Steven M.L. Aronson. Barbara (Julianne Moore), tries to adjust to an upper-class lifestyle while developing an uncomfortably close relationship with her son, Tony (Eddie Redmayne). Barney Clarke portrays Tony as a young child. Julianne Moore’s brilliant performance as Barbara enlivens an otherwise bland plot with poor character development. Just because none of the characters are particularly likable doesn’t ruin your enjoyment of the film. However, it does take away from how absorbed you feel about the scenes you’re watching. Screenwriter Howard A. Rodman initially provokes the audience with the themes of dysfunction, sexual identity and insanity within an upper-class family, but he doesn’t take those ideas far enough to be consistently compelling—he merely scratches the surface. On a positive note, director Tom Kalin includes interesting choices for music along with beautiful cinematography, colors, lighting, set and costume designs which make you feel like you’re watching a Godard film such as Contempt. 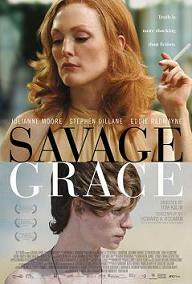 If only the screenplay were to entertain your mind rather than mostly entertaining your eyes and ears, Savage Grace would have been much more powerful and moving. Number of times I checked my watch: 6. Released by IFC First Take. Opens at the IFC Center. - Directed by Bryan Bertino. James (Scott Speedman) and Kristen (Liv Tyler) defend themselves against three mysterious, masked strangers who terrorize them in their isolated vacation home. Anyone who has watched a horror film in the past will notice how the plot includes all the clichés in the book of horror, ranging from cell phones that don’t work when needed to intense scenes taking place at nighttime to characters asking the villain, “Why are you doing this?” or “What do you want?”. Just because the scenes feel intense, though, doesn’t necessarily make them feel scary. Writer/director Bryan Bertino certainly knows how to add an eerie atmosphere through lighting, set design and sound effects. However, the script has too many careless holes, preposterous moments and not enough suspense or imagination when it comes to who or what the strangers are and what their motive is. Occasionally, some of the awkwardly stilted dialogue generates unintentional humor. At least it’s somewhat refreshing to watch Liv Tyler back on the big screen and playing the type of role that she hasn’t played before. If only The Strangers were as surprising and smart as other similar horror films such as last year’s underrated Them and it didn’t resort to cheap scared, it would have been much more frightening, taut and haunting. Number of times I checked my watch: 5. Released by Rogue Pictures. - Directed by Stuart Gordon. Inspired by a true story. After a night of partying, Brandi (Mena Suvari), a hospital caretaker, crashes her car into Tom (Stephen Rea), a homeless man who ends up stuck headfirst in her windshield while still alive. She fears that she might not get a job promotion if she were charged in the hit-and-run accident, so she ignores his desperate pleas for help and utterly neglects him. It’s quite gripping to watch as Tom tries to get out of his tragic situation. For example, he reaches for a cell phone that Brandi happened to have left in her car while she’s at work, but even once he grabs it and dials 911, the results are quite shocking and even more disturbing. The screenplay by John Strysik allows the tension to build rapidly and for Brandi to become more and more malevolent and stupid in her actions (and her inactions). He also includes some brief, albeit dark, comic relief. Admittedly, the third act does fall apart with over-the-top and implausible scenes, but director Stuart Gordon keeps you hooked with a well-chosen musical score and gruesome, sick gore that adds to the creepiness factor. It’s one of those cases when you want to look away, but you can’t, which is the essence of rubber-necking. What’s truly horrifying about Stuck is that, up until the third act, much of what occurs could--and did—actually happen in real life. Within a matter of seconds, a seemingly ordinary person can become cruel and inhumane without rhyme or reason. It reminds you that the crazy world that we live in is, sadly, inhabited with selfish and insensitive people. Number of times I checked my watch: 2. Released by THINKfilm. Opens at the Angelika Film Center. - Directed by Giuseppe Tornatore. In Italian with subtitles. Irina (Ksenia Rappoport) buys a fancy apartment across the street from Donato (Pierfrancesco Favino) and his wife, Valeria Claudia Gerini), whose young daughter, Thea (Clara Dossena), she takes care of. Meanwhile, Irina’s troubled past with a violent, sadistic man, Mold (Michele Placido), haunts her. Ksenia Rappoport delivers a convincing performance that allows you to feel immersed into the story and to care about what happens (and what had happened) to her character. The plot gradually becomes more suspenseful as it progresses. When Irina arrives at her new apartment, there are some elements of horror that increase the tension even further. Writer/director Giuseppe Tornatore does a superb job of weaving the story through many intricate layers in an interesting fashion, without overusing flashbacks. He wisely doesn’t reveal everything about Irina’s mysterious past, which keeps you riveted at edge of your seat and hungry for more revelations. None of the twists will be revealed, though. Moreover, Tonatore includes very impressive cinematography, lighting and set design to create a creepy mood. Admittedly, the rushed third act does fall apart a bit with too many contrivances and gimmicky scenes, but that doesn’t take away from keeping you engaged in the suspenseful drama filled with intriguing psychological thrills. Number of times I checked my watch: 0. Released by Outsider Pictures. Opens at the Angelika Film Center. - Directed by Jon Else. This fascinating documentary follows the behind-the-scenes process of creating “Doctor Atomic”, an opera about the 48 hours leading up the Trinity test of the atomic bomb, which J. Robert Oppenheimer had invented. Director Jon Else wisely incorporates archival footage of Oppenheimer which gives you very useful background information about him and the history of the atomic bomb. Opera and theater fans, in particular, will find it interesting to watch as Peter Sellars directs the “Doctor Atomic” opera while using his artistic imagination to extrapolate by using songs taken from a variety of sources, such as The Bhaghavadgita. Admittedly, the narration by Eric Owens feels a bit monotonous and cold while director Jon Else doesn’t focus enough on the opera’s composer, John Adams, who could have added some insight into his artistic genius. However, Wonders Are Many has smooth, slick and lively editing and there’s enough insight into the experiences of Oppenheimer, the science of the atomic bomb, and the artistic genius of Peter Sellars to keep you intrigued. Number of times I checked my watch: 1. Released by Actual Films. Opens at the Quad Cinema.